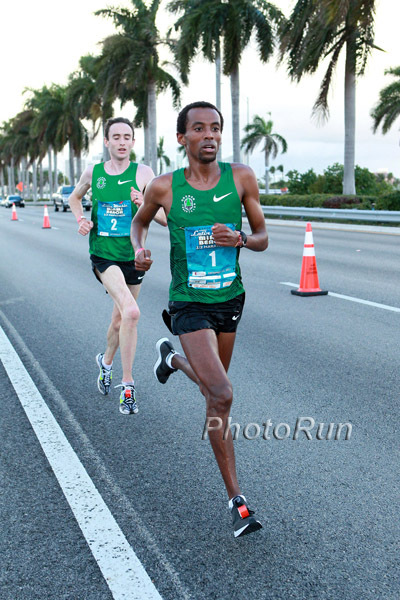 Simon Bairu and Shalane Flanagan notched victories in their final tune-ups before January’s Olympic qualifying attempts in Houston, each reaching the tape first at the Latin Music Miami Beach Half Marathon. Coming into the day under heavy training loads — a calculation intended by coach Jerry Schumacher to simulate running hard in the second half of January’s 26.2-mile efforts — Flanagan came in just below her prescribed goal, hitting 1:09:58, while Bairu clocked 1:05:38, just ahead of teammate Brent Vaughn and his 1:05:41. Tim Nelson took 3rd in 1:07:44. Flanagan was fourth to the line, overall, beating all other entrants except for her male teammates. Her performance was just 81 seconds off of her personal best, set last year in Philadelphia.